How Editorials Happen: A conversation with Nicholas Goldberg, editor of the LA Times editorial pages, Leo Baeck Temple, 1300 N. Sepulveda Blvd., Los Angeles, May 9, 2018. Fiddler on the Roof screening, sing-a-long and book signing, Royal Theatre, 11523 Santa Monica Blvd., Los Angeles. December 24, 2017, 6:30 pm book signing, 7:30 pm, film. Fiddler on the Roof talk and book signing, Stephen Wise Temple, 15500 Stephen Wise Drive, Los Angeles, February 9, 2017. A Celebration of Fiddler on the Roof. Temple Beth Israel, 3033 N. Towne Avenue, Pomona, CA. Talk, musical performance, book signing and dessert reception. Nov. 5, 2016. Art Matters: A Visit with Norman Lear. American Jewish University, 15600 Mulholland Dr., Bel-Air, CA. Norman Lear and Barbara Isenberg in conversation about Lear’s storied television career, political activism, new book and PBS-bound documentary. Sept. 18, 2016. Barnes & Noble, 160 East 54th St., New York, NY, May 9, 2016, 7pm, Tradition! author Barbara Isenberg and audiobook narrator Adam Grupper, from Broadway’s “Fiddler on the Roof,” discussion and book signing. Los Angeles Times Festival of Books, University of Southern California, April 9, 2016, Norris Theater, panel moderator for “Make Em Laugh: A Look at Comedy from All Sides,” and book signing. Temple Emanu-El Skirball Center, 1 East 65th St., New York, NY, March 2, 2016, 6:30 pm, “Books on Broadway: Tradition!” talk and book signing. Rancho Mirage Writers Festival, Rancho Mirage Public Library and Annenberg Center, January 22, 2016, 71-100 Highway 111, Rancho Mirage, CA 92270. 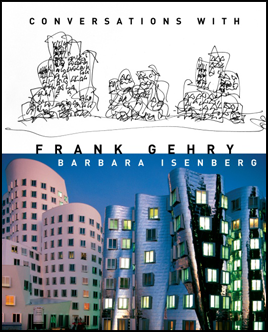 Illustrated talk on Frank Gehry. Art Matters: Inside LACMA’s Frank Gehry Exhibition, American Jewish University, 15600 Mulholland Dr., Bel-Air, CA. Barbara Isenberg interviews LACMA curator Stephanie Barron, January 10, 2016. Walt Disney Concert Hall Store, 111 S. Grand Ave., Los Angeles, December 6, 2015, noon to 5pm, book signing. Temple Beth El Riverside, talk, book signing, potluck supper and “Fiddler on the Roof” screening, 2675 Central Avenue, Riverside, CA, November 14, 2015. USC Casden Conversations Series, Barbara Isenberg and Gail Eichenthal, Casden Institute for the Study of the Jewish Role in American Life, USC, Doheny Library, April 26, 2015. Los Angeles Times Festival of Books, University of Southern California, April 18, 2015, “All That Glitters: Arts in a Golden Age,” panel discussion and book signing. Wilshire Boulevard Temple Community Concert and Sing-along , 3663 Wilshire Blvd., Los Angeles, CA. 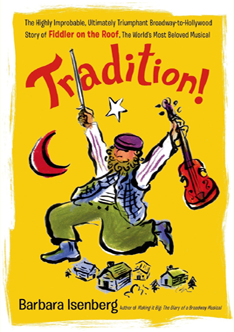 December 14, 2014, “Tradition!” talk, book signing and “Fiddler on the Roof” 50th anniversary celebration. Books & Books, 265 Aragon Ave, Coral Gables, FL, December 9, 2014, 8pm, “Tradition!” talk and book signing. Marcus Jewish Community Center Book Festival, MJCCA-Zaban Park, 5342 Tilly Mill Road, Dunwoody, (Atlanta), GA.,November 12, 2014, talk and signing. The Drama Book Shop, 250 W. 40th St., New York, NY, November 10, 2014, Barbara Isenberg and playwright John Weidman talk about “Fiddler on the Roof” and other musicals and book signing. The Village Temple, 33 East 12th Street, New York, NY, November 7, 2014, music from “Fiddler on the Roof,” Shabbat, talk and dinner. Westport Library, 20 Jesup Road, Westport, CT., November 5, 2014, 6:30 pm talk and book signing. St. Louis Jewish Book Festival, JCC, 2 Millstone Campus Dr., St. Louis, MO, November 3, 2014, 7:30 pm, talk and book signing. Upper East Side Barnes & Noble, 150 East 86th St., New York, NY, September 22, 2014, 7pm, Barbara Isenberg hosts 50th anniversary celebration of “Fiddler on the Roof” with Joanna Merlin, Austin Pendleton and Jerry Zaks and book signing. Los Angeles Times Festival of Books, University of Southern California, April 20, 2013, panel moderator for “Telling Hollywood Tales” and book signing. Books&Books, Miami Beach, Florida, January 24, 2011, illustrated talk about “Conversations with Frank Gehry”and book signing. WBAI-FM, New York, “Nonfiction,” December 18, 2009, Harry Allen interviews Barbara Isenberg. Free Library of Philadelphia, May 12, 2009, Central Branch, 1901 Vine St., Barbara Isenberg in conversation with Frank Gehry. New York Public Library, May 11, 2009, 7pm: Bartos Forum Humanities and Social Sciences Library 5th Avenue and 42nd St NY, NY. Paul Holdengraber in conversation with Frank Gehry, Barbara Isenberg and Alex Ross.